North Carolina’s electric cooperatives were proud to recently honor a family that has benefited from the Ronald McDonald House (RMH) of Eastern North Carolina. 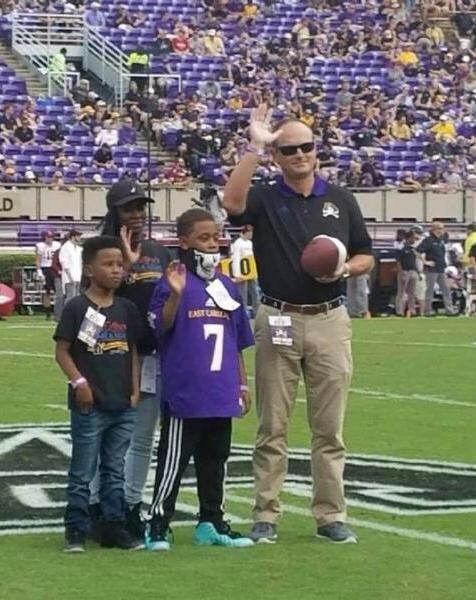 Edgecombe-Martin County EMC CEO Winston Howell, who serves on the RMH board of directors, presented the Collins family with a game ball at the October 7th East Carolina University football game in Greenville. RMH is an essential resource in eastern North Carolina, providing families with quality care and a place to rest and recharge while their children receive medical treatment. This care and a comfortable “home away from home” can make all the difference for families during times of unthinkable tragedy. Electric co-ops work with RMH each year to give one family that has stayed in the House a day out at an ECU game.